Robert Blair Carabuena mauling an MMDA (Metro Manila Development Authority) enforcer was actually a national news item a few days before we mourned over Sec. Jesse Robredo’s demise. 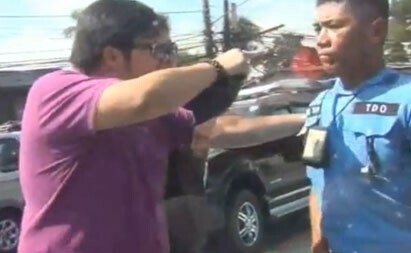 It was Aug. 14 when TV5 caught on video how this man maltreated Saturnino Fabros. Who is Robert Blair Carabuena? When I first saw the video and read the news report, my initial reaction was just like everyone else’s. I felt pity for the traffic aide while he was slapped and called names. I instantly searched for more information on Carabuena over the web and found his Facebook profile already deactivated. However, his LinkedIn profile was still active at that time. It’s no longer active at this point. But on the same online portfolio, I found out he is currently a human resource manager for Phillip Morris Fortune Tobacco Corp. (Philippines) and studied in Ateneo. After the incident, he did not report to work the following day and is already suspended now. As for Fabros, he was promoted to Traffic Constable 2 and his 6 daughters were assured of educational scholarships. At least there was something good which came out of the whole drama for him. 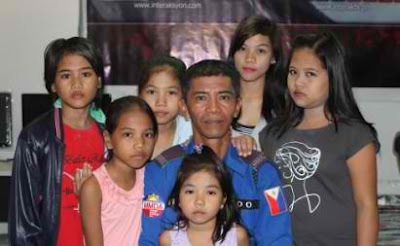 He is a devoted single dad who had been a traffic enforcer for 12 years now. He had been on the streets for nearly 2 decades now, first as a street sweeper for 7 years before he was designated a traffic aide when he earned his high school diploma through Fort Andres Bonifacio College Annex in Taguig City. Going back to Carabuena, it wasn’t about his employment position, his educational background, his money, and even his green Volvo vehicle. Not all rich folks with flashy cars, money, and good status would behave the way he did. It was all about him and the type of person he was. But I didn’t hopped into the bandwagon of everyone bullying him online calling him names such as Barney, litson, baboy, etc. Bullying the bully makes you no different from him right? Everyone can’t help but express their sympathy for the MMDA officer though by getting back at the attacker through cyberspace. The video doesn’t show the incident in its entirety but according to Carabuena’s father, the MMDA aide was continuously tapping his vehicle from behind. I don’t know if it was to stop him because of a violation but I can attest to the fact that they do that indeed. I’ve experienced it before. It was only mild tapping anyway and we simply drove off and didn’t bother to stop because we didn’t violate any traffic rule. In Carabuena’s case, he stopped, got off the vehicle, and confronted the officer. His father even said that it was Fabros who first cursed at them. Nonetheless, there is no justification for assaulting a public servant especially while on his duty. Thus, Carabuena will face the consequences of his actions. His brother may be implicated in the case too for holding Fabros’ hands while Robert Blair slapped him. His apology at the MMDA office last Aug. 23 was accepted but the criminal case against him will pursue according to MMDA chairman Francis Tolentino. Most people were doubtful about Carabuena’s apology. He was all geared up in a formal office wear and was reading a script the whole time. It could be so he can express his thoughts better or it could be because that’s what he was told to do. Days after the incident, he said he consulted family, friends, and a lawyer. I’m assuming that the public apology was recommended by his attorney. Everyone who was present at the prosecutor’s office expressed their dismay when they cussed and doused Carabuena with water. He was then rushed to an undisclosed hospital because he was sweating hard even though it was cold in the office.